Republicans jammed through their health policy guru in the middle of the night, and they and their new HHS Secretary are still trying to figure out what to do with the Affordable Care Act, aka Obamacare. Insurance markets are on the brink of chaos, and the mess is angering increasing number of Americans who may soon see their costs rise, their medical care decline, and their health imperiled. The president and the speaker of the house continue to be at odds as to the timing of the GOP’s long-promised pledge to repeal and replace Obamacare, with the timeline stretching to the year’s end or beyond before the public gets to see the outlines or details of Republicans’ Trumpcare. Meantime, the administration has submitted regulations it says will stabilize health insurance markets—and these are sowing their own confusion. Are these all the vaunted “repairs” the GOP plans? (I’ve written how repair is the new GOP buzzword to explain why the party hasn’t met its ACA repeal-and-replace pledges). and to shrink the open enrollment period and the time that customers can be delinquent with payments. Even these “technical” fixes, proposed previously, too, in legislation, have created controversy, especially over age-based decision-making in health insurance coverage. More fundamentally, the GOP—now caught up in a storm of its own making of competing proposals of what Trumpcare ought to be and even what Obamacare is or isn’t—has created what one news report described as “massive confusion” among health insurers about what coverage they can or should provide to tens of millions of Americans. This is a time-critical issue, because the companies in a few weeks must put together and submit for regulators’ approval their offerings and rates. One insurer says its customers might face rates that would rise anywhere between 7 and 40 percent. With all the uncertainty caused by the GOP insistence on giant changes in health care, it’s still unclear whether insurers may withdraw from markets, leaving tens of millions without coverage or paying steeper rates to the fewer competitors left. ACA foes were so reflexive and hardened in their all-in opposition to Obamacare that one of their key hurdles to its repeal and replacement is their incapacity to accurately and fairly assess what it does or doesn’t do: The New York Times has offered a quick overview, and Kaiser Health News has examined what has worked well in the states. Republican senators from states that expanded Medicaid under Obamacare are meeting separately from other party stalwarts to figure their possible legislative course. Lobbyists and health policy experts in Washington, D.C., are so at sea they’re quizzing journalists for snippets of information. As mentioned, attention is focusing on what happened with the ACA in the states, though here the record is mixed: Minnesota may have found potential alternative options, while Idaho and its Republican leaders got so mired in the complexity of health care that efforts to create a “better” Obamacare foundered. President Trump and other party members, of course, have lionized Price during his confirmation process as the GOP’s leading light on health care policy, especially in figuring how the repeal, replacement, and repair of Obamacare will work. But his performance on the national stage, thus far, has been uninspiring. David Leonhardt, a former Washington bureau chief and now a columnist for the New York Times, dubbed the Atlanta orthopedic surgeon “Dr. Personal Enrichment,” due to his glaring ethical challenges in investing in health care stocks even as he legislated on issues affecting those companies. His financial dealings have been deemed “brazen,” as he invested and traded most actively during a time when the Securities and Exchange Commission was investigating a congressional committee on which he sat. He was not the probe’s target, a committee staffer was. (Since the Trump Administration has come into office, the SEC investigation has come to a halt). 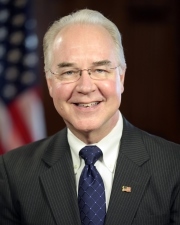 But a George W. Bush-era ethics expert has said Price’s investment activities were ill-advised, occurring so robustly as they did during a time when public sentiment ran high against members of Congress and their staffs enriching themselves while serving in office. Price insists he did no wrong and sees no wrong in the way he has handled his personal finances. He has agreed to divest most of his holdings. He was confirmed on a strict party-line vote. Now, he wields major sway over the nation’s health care from his post heading the trillion-dollar HHS agency. He can, with his powers as secretary, take steps to kill Obamacare quickly, defund women’s reproductive health services, eliminate efforts to force doctors and hospitals to lower costs and operate more efficiently and transparently, and create yet another firestorm by allowing caregivers to assert their religious convictions in refusing to provide medical services to which they object. I’ve written before how Price and the GOP have radical plans to upend American health care, gutting Medicaid, attacking Medicare, and whacking Social Security. With the falsehood of fiscal rectitude and getting government out of medicine, the partisans will try to strip patients harmed while seeking medical services of their right to seek justice and the economic support they may need for a lifetime. In my practice, I’ve seen how Americans can get ground down by big hospitals and affluent doctors with fancy reputations, and how they’re harmed by dangerous drugs and deadly devices. Yes, some clients can seek and find justice with civil suits. But in health care, a sector so awash with money that it comprises 17.5 percent of the gross domestic product, we ordinary Americans need a powerful presence that looks out for us—our imperfect government, by the people and of the people. We can’t allow a lot of policy mumbo-jumbo to disguise that Price and partisans like him will, if they follow the course they have described, savage the old, sick, poor, women, and already disadvantaged people of color with their so-called health care “reforms.” It cannot be said enough that many of the people who will be hurt most will be the very voters who put the GOP in power. Republicans have expressed shock, even worry about their own safety as restive constituents have barraged their phones, emails, and jammed the few town halls that have gone forward since the administrations turned over. Peaceful, powerful demonstrations of how democracy works are great. We need to let our elected officials know that our health and our lives are stake and we want a health care system that is affordable, accessible, safe, efficient, and outstanding.